Enlisting the support of Britain, then the world’s leading power, to the cause of establishing a Jewish state in Palestine was the Zionist World Organisation’s biggest achievement since its establishment in 1897. On November 2, 1917, while a new world order was being forged in the cauldron of the First World War, two Zionist leaders, Chaim Weizmann and Nahum Sokolow, secured a pledge from the British government through its foreign minister Lord Balfour to “view with favour the establishment in Palestine of a national home for the Jewish people”. Even though the Balfour Declaration was integrated into the political texts of the post-war Franco-British reordering of the Middle East, the establishment of a Jewish entity in Palestine was far from guaranteed. In 1929, Chaim Weizmann created the Jewish Agency, which was able to make diplomatic and financial inroads around the world (even in Arab countries), serving the ultimate objective of establishing a Jewish state. Yet, many upheavals ensued in the decades that followed, and resistance from Palestinian Arabs to Jewish immigration escalated. The British, seeking to preserve order in a region vital to their interests, were more or less dragging their feet on implementing their promise. In 1939, another global conflict erupted. Six years later, the United States emerged as the world’s pre-eminent power after crushing Nazi Germany and Imperial Japan, seconded only by the Soviet Union. The horrors of the Second World War, especially the Holocaust, brought the Jewish question to the forefront of American domestic and foreign policies. The White House was flooded with letters and telegrams from Americans, both Jews and gentiles, demanding the administration to support giving the Jews who fled Europe after years of suffering a national homeland. Many American Jews who were reluctant to support the Zionist agenda before the outbreak of war, now became active supporters of establishing a Jewish homeland in Palestine. The Jewish Agency exploited this shift in American national sentiment and the dramatic change in the international balance of power, and was able to secure American support for its quest to establish a Jewish state in Palestine. In May 1942, David Ben-Gurion represented the Jewish Agency at a Zionist conference held in New York City’s Biltmore Hotel. The conference lent support to an unprecedented programme, later termed the Biltmore Resolution, demanding unrestricted Jewish immigration to Palestine, the creation of a Jewish army, and the establishment of Palestine as a Jewish commonwealth. In that period, the relationship between the Zionist movement and the US Department of State was one of mutual distrust. Contrary to Zionist accusations, evidence shows that the State Department did not favour the Arabs, but tried to maintain a policy of neutrality and non-entanglement in Palestine, fearing that US support for Zionist schemes would agitate Arab countries and could harm American oil interests in Saudi Arabia. The Zionists, nonetheless, bypassed the State Department and successfully got the White House on their side by injecting the Jewish question into the American electoral game. In the White House, Truman was flanked by two avid lobbyists for the Zionist cause. Clark Clifford and David Niles, both councils to the president, successfully steered Truman’s decision-making in favour of the Zionist project and against any objection coming from the State Department or any other voice of opposition. The tug of war between the White House and State Department reached its apex when Truman, following Niles’s suggestion, appointed John Hilldring, a State Department official close to American Jewish leaders, as an adviser on Palestine to the American delegation at the United Nations, just days before the fateful debate on the partition of Palestine at the General Assembly. Hilldring reported directly to Niles and did not communicate a single piece of information to the State Department. On November 29, 1947, the General Assembly voted in favour of establishing a Jewish State on 56 per cent of Palestine’s territory, even though Jews made up only one third of the population. Palestinian Arabs were told to establish a state on the remaining territory. Nonetheless, there was no workable plan to implement Resolution 181. US Secretary of State George C. Marshall suggested a United Nations trusteeship over Palestine. Zionists vehemently opposed Marshall’s suggestion. Clark Clifford argued that “the American people” reject any act of appeasement towards the Arabs, asserting that Arabs have to either sell their oil to the United States or go broke. The US Department of Defence inadvertently reinforced the Zionist position by asserting that a US military deployment to enforce any UN mandate is unfeasible. The British mandate for Palestine was to be terminated by May 14, 1948. Three days before the decisive date, Marshall went to the White House to argue for a UN trusteeship. When Clifford and Niles turned down his proposals, he threatened to resign, all to no avail. David Ben Gurion announced the establishment of Israel on May 14, and Truman was the first world leader to extend de facto recognition to the new state. Stalin followed shortly after. The Arab countries immediately declared war on Israel. As the conflict escalated, the State Department pleaded Truman to approve the Bernadotte peace plan, but again Niles and Clifford blocked all efforts for a compromise. Weeks before the 1948 US presidential elections, Truman could not risk losing the Jewish vote by accepting what Republican candidate Thomas E. Dewey had already refused. Acting on Clifford’s advice, Truman instructed the American delegation at the UN to avoid any action on Palestine without the president’s personal authorisation. UN debate, he said, must be deferred until after the elections. By thwarting the possibility of a negotiated settlement, Truman gave the Israelis enough time to capture as much land as possible before the armistice negotiations with the Arabs. As a result, thousands of Arabs were massacred, and hundreds of thousands fled their homes. The historical legacy of Arthur Balfour must not overshadow that of Harry Truman. 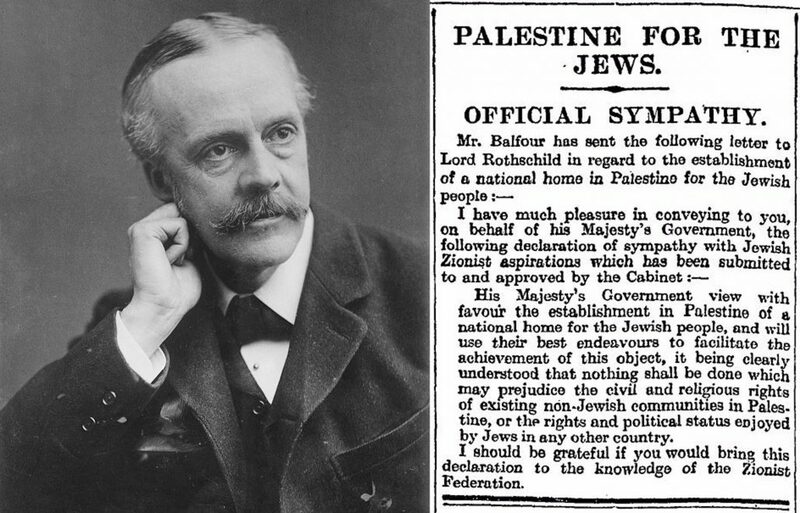 Balfour gave a pledge in 1917 to establish a Jewish state on the land of Palestine, but it was Truman’s deliberate policies that made this pledge a reality in 1948. Furthermore, the dangerous patterns Truman had established continued to dominate the American-Israeli relationship for decades, all to the detriment of peace in the Middle East. Fadi Esber is the editor of Dimashq Journal.